All photos courtesy Water of Life. If you've ever been to a whisky show, you know the drill. Tables form aisles, and in front of every table is a throng of people — at times impenetrable, depending on the popularity of that particular whiskey — brandishing Glencairn glasses while a harried brand representative scrambles to give everyone a pour while fielding occasional questions shouted out from the throng. Depending on your mood and how many you've been to, it can be exciting, frustrating, enlightening, or just a way to get a drink of something you can't otherwise afford. It's the standard format, and it's been in place now for about as long as there have been whiskey shows. When Matthew Lurin, an emergency medicine physician in Manhattan, long-time whiskey aficionado, and a veteran of countless whiskey shows, events, fests, and gatherings decided to put together his own event, he wanted to do things a little differently. "I've always loved going to whisky master classes," Matt explains. "Sitting down and getting a chance to learn about one brand or one theme is quite fun and lends itself to some great discussion. I prefer this to elbowing my way to my next dram, and loved many of the classes I'd attended in the past." The idea he came up with, he jokingly described as "whisky speed dating." "I was at a great show, the nth in Las Vegas," explains Lurin, "and saw a sign for whisky speed dating. I had an amazing time, and I pictured a way to expand the concept and make this into an entire evening. In my vision, the brands would be stationary and guests would visit their tables, which was the opposite of the Las Vegas version." Lurin sought the blessing of nth founder Mahesh Patel to adapt the concept, adding perhaps the most important aspect: that it be for charity. Patel readily agreed. This is how it works. Instead of grabbing a Glencairn and joining the fray, attendees to Lurin's event, which he called The Water of Life, grab a Glencairn and then receive a "dance card," a schedule of brands and tables for them to visit. One then proceeds to one's first assigned table, joined by no more than four other people, sits down, and actually gets to listen and learn as the brand's representative talks and tastes them though the whiskies they're presenting. Twelve minutes later, an announcement goes out and everyone proceeds to their next table. The charity aspect of Lurin's event was important to him. His stepfather, who was the first one to introduce Matthew to the world of whiskey, suffered from a gastrointestinal stromal tumor (GIST). When looking for a charity to partner with for the event, Lurin chose the Life Raft Group, an organization dedicated to GIST research and support. He worked with them for the first and second year. This year, Water of Life's third, Lurin has paired with the GIST Cancer Awareness Foundation. He's also expanded the event from one night to two, with the first being an "ultra-VIP" event during which brands will be pouring some extremely rare whiskies, including ones not likely to be found anywhere else. Among those will be a Mars Whisky Komagatake 30 Years Old Single Malt from Japan. Currently unavailable in the United States, the bottle was a gift to the Water of Life from Flavien Desoblin of New York's Brandy Library and Copper and Oak. The second night of the event hosts both a general and VIP level, and in the past a number of whiskies have made their New York (if not their world) debut at the show, including Lagavulin 8 (gold medal winner in the 2016 NY International Spirits Competition), Compass Box Circus, Macallan Edition 1, Ardbeg Dark Cove, Glenmorangie's travel retail editions, and Highland Park Ice. 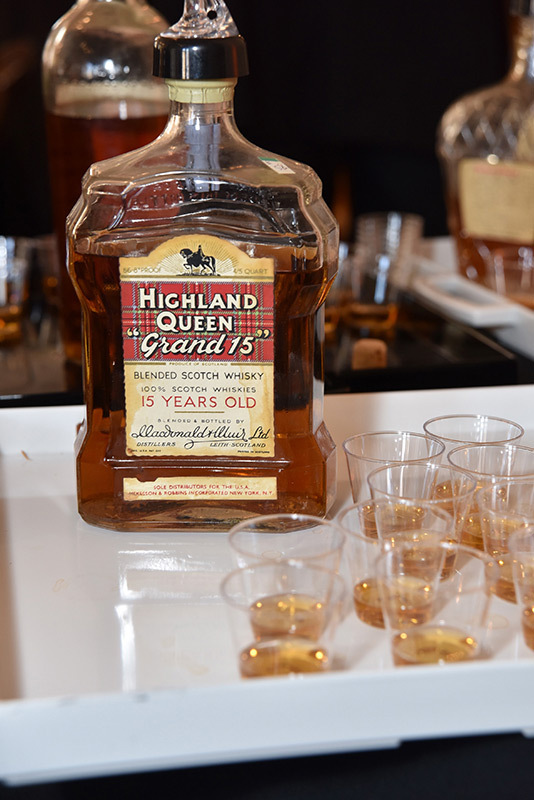 In addition, the show boasts a number of brands who rarely make appearances outside of Whiskyfest or their own sponsored events. Says Lurin, "In New York you can only find The Macallan at their own events, Whiskyfest, and Water of Life. Single Cask Nation is poured at the Whisky Jewbilee and Water of Life. [The Scotch Malt Whisky Society] pours at their own Extravaganza and Water of Life. Some of the smaller brands with less of a marketing budget have loved our format, and getting the biggest and smallest brands all under one roof is a great accomplishment. And then, what they choose to pour...just wow!" In case that wasn't enough, there's also a cigar lounge, master classes, and even live music. Not to mention rare whiskies that Lurin and the Water of Life staff have been sworn to secrecy over. Organizing even a small whisky event, especially in a city like New York where space is a premium, the population is both dense yet somehow spread out, and there are several large events throughout the year, is a daunting task. For Lurin (who cites his previous experience for organizing something on this scale as "I could throw a pretty good party"), creating and maintaining something as large as Water of Life has proven as rewarding as it is challenging. "The first thing I needed to do was to reach out to a few good friends in the industry," he explains when discussing how it all came together. "I spoke with a few ambassador friends I've known for a few years; I spoke with folks who run other whisky events; I spoke with other collectors and whisky fans. And I searched whisky calendars to avoid date conflicts, and then went venue hunting. It's hard to describe how it all comes together as there are so many moving parts that need to line up. But if you like a challenging problem, starting an event like this from scratch is quite the endeavor." Carrying him through it all is Water of Life's slogan: Drink Whisky to Fight Cancer. "I truly believe a love of whisky extends far beyond what's in the glass. I find the person holding the glass next to me has interesting stories to share, and the bonds formed over whisky and cigars is like no other."